Deadline for booking and payment up to 6 марта 2019. Cancellation up to March 6, 2019 - no fee. Cancellation made after March 6, 2019 - a penalty of 1 night stay. Cancellation made after March 16, 2019 - penalty of 100% of the payment for accommodation. Booking hotel without a guarantee of rooms - after March 6, 2019. Without the order payment after March 16, 2019 - Pre-booking will be cancelled. All refunds shall be made after the Conference, net of banking and additional charges. The rooms of the hotel Yunost offer panoramic views of the monuments of Russian culture, unique sports facilities and memorable places in Moscow. This is the Vorobyovy Gory, Novodevichy Monastery, Moscow River, as well as the legendary sports complex Luzhniki with a shopping complex and Moscow City. The noble district of the capital Khamovniki is a worthy choice if you are interested in museums, history and culture. Enjoy the convenience and comfort of accessibility to the historical sights of the city. The hotel with a great history, now well rebuilt in a modern style, is conveniently located in the center with a view of the capital. Yunost provides a wide range of services: Restaurant IL Rosso, bar, free wi-fi, cable TV, currency exchange, ATM, storage room and safe, order food in the room, ordering a taxi and tickets, security and safety. The current administration of the hotel continues the tradition of hospitality and successfully cope with servicing not only official delegations, but also with the service of businessmen and tourist groups. 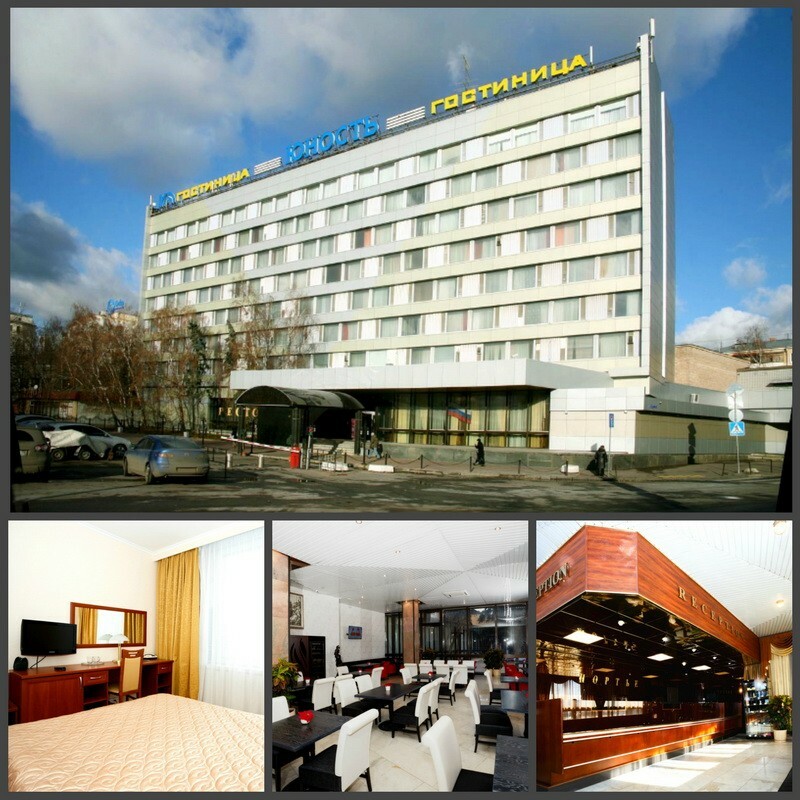 Constantly improving, the hotel Yunost has established itself as a comfortable hotel, which has all the necessary infrastructure for different categories of customers. * Price in EUR is approximate and based on the rate 1 EUR=76 RUB. Please, rely on the price given in RUB. Check-in - 12:00, check out - 12:00. Rates include accommodation, VAT and breakfast. 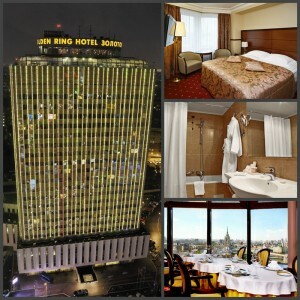 The 5-star Golden Ring Hotel is located 7 minutes from the pedestrian Arbat Street in Moscow. 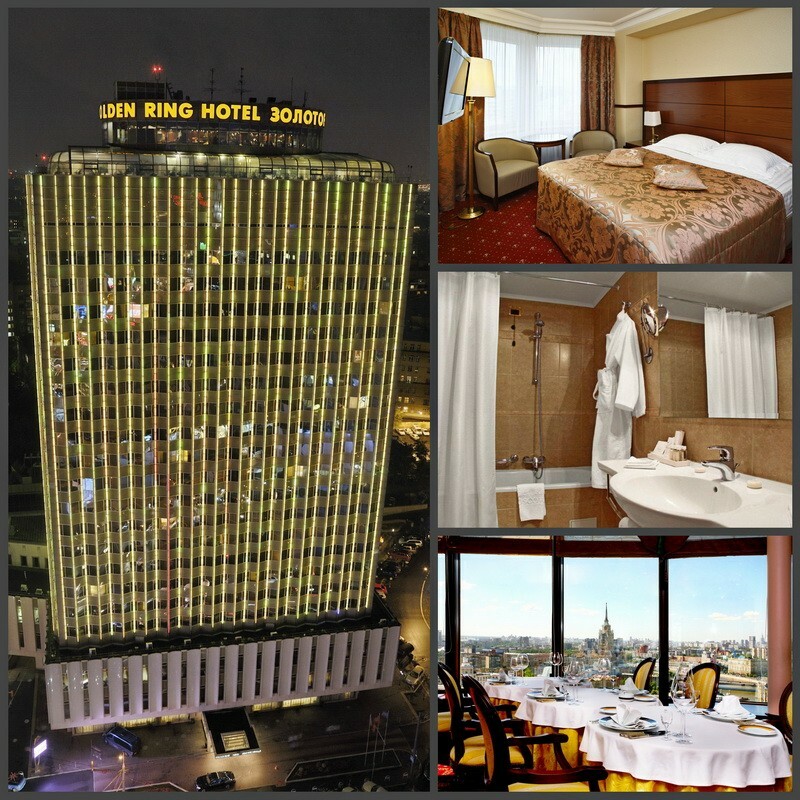 Certain advantages of the hotel include: a convenient location, because the hotel is located in the center of Moscow, luxurious rooms with stunning views and a number of additional services that will make your stay the most comfortable. The hotel rooms at your disposal safe, heat ventilation system, satellite TV, beds with orthopedic mattresses, mini-bar, Internet. The Panorama restaurant at a height of 80 meters, as well as the Winter Garden restaurant, serves international and Russian cuisine. Buffet breakfast is served at Suzdal Hall. Drinks can be enjoyed in the Diamond Lobby Bar on the 1st floor, which is ideal for business meetings. The Golden Ring Hotel has a spa with a fitness center, an aromatherapy steam bath and a beauty salon, where you can book various treatments and get wellness services. Hotel services include car rental with driver and airport transfer. The hotel decorates with its facade one of the central streets of Moscow. The building of the Ministry of Foreign Affairs of Russia is located opposite, the Kremlin museums, Red Square, representative offices and embassies of foreign companies and the Expocenter international exhibition center are nearby. Check-in - 14:00, check out - 12:00. Description when specifying the code word TRIALOG , You will be given a small discount.